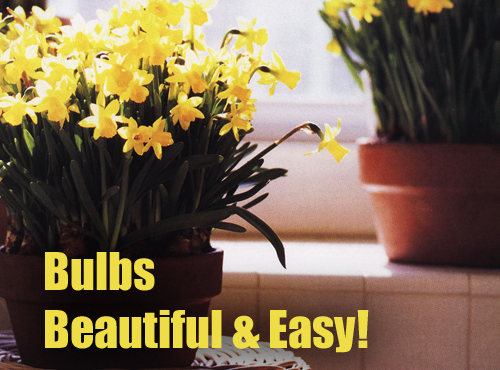 Beautiful and easy to grow, bulbs in containers provide color indoors or out. Keep blooming season in mind when you choose bulbs, if you select an assortment with successive blooming periods, you can treat yourself to a non stop flower show from early spring right through summer and into autumn. 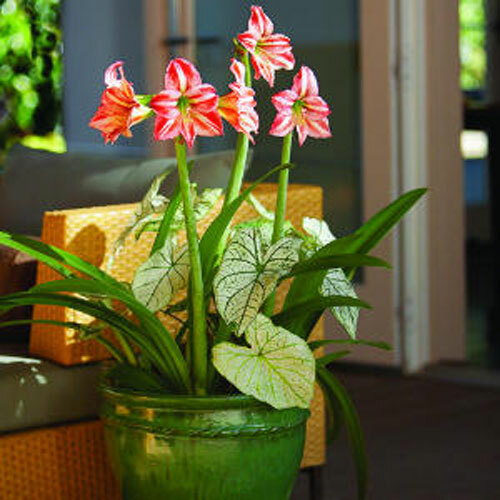 Bulbs such as amaryllis are quite content to take up residence in containers, producing splendid blooms year after year. But other types like crocus, hyacinth, iris and tulip, usually provide just one unforgettable season of container bloom. The next year, flowers are likely to be smaller and fewer. Many gardeners prefer to move these types from containers to garden flower beds after the first year. Always buy the best bulbs available, usually graded number 1. They may cost more but their improved performance more than makes up for the higher price. Plant bulbs as soon as possible after they appear for sale usually in autumn for spring flowering. Many potted bulbs need cold temps during part of their dormant period if they are to bloom. Where winters are frost free, refrigerate the bulbs before planting. Almost all bulbs grow best in a loose mix of equal parts garden loam, coarse sand and organic matter like peat moss. 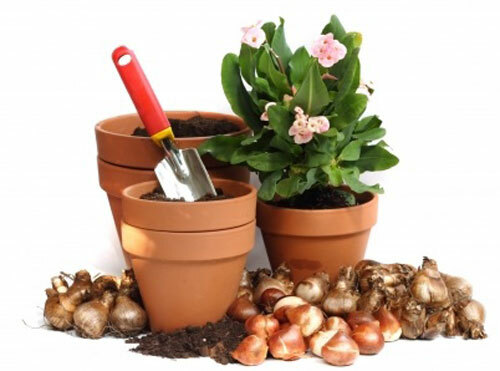 Plant large bulbs with their tips pointed ends level with the soil surface. Smaller bulbs should be 1" to 2" inches below the soil surface. While roots are forming, you will need to keep soil cool to prevent premature sprouting. Place your garden containers in a cools dark spot. After about 8 weeks check a few pots looking for roots in the drain holes and leaf tips poking thru the soil. Place the containers in a sunny spot where top growth can develop and turn green, then begin watering. 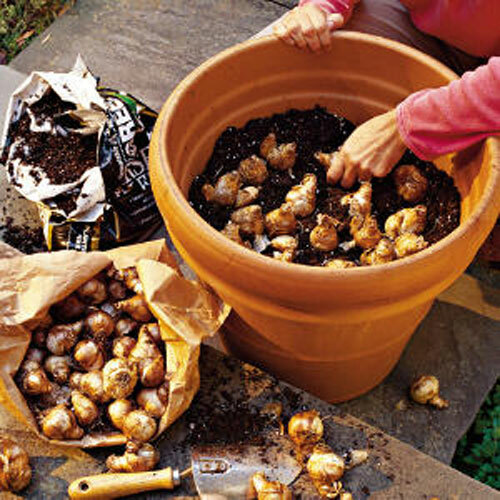 Growing bulbs in garden planters is easy and fun to do. Read more.....Happy Herbs and Herbs that Heal. Read more.....Create this plant container for home or garden.